I really do love fall. It’s definitely one of my favourite season—the other being spring. I love the fall colours, the cooler temperatures and best of all, the harvest. I love going to the farmer’s market on the weekend and seeing the stalls set up with local apples, pears, pumpkins, squashes and other root vegetables. With Halloween just around the corner, it means that for one night, we can eat as much sugar and not feel (too!) guilty about it. Originally, I wanted to make something with candy in it, in keeping with the spirit of Halloween. 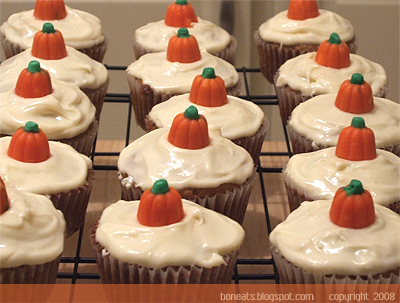 But I got pulled in the opposite direction after I saw these little pumpkin candy corns at the store, and decided to make Pumpkin Cupcakes with Cream Cheese Icing instead. This is another Martha recipe. I made an extra half batch of cupcakes to get enough cupcakes for everyone in my class, and they turned out great. 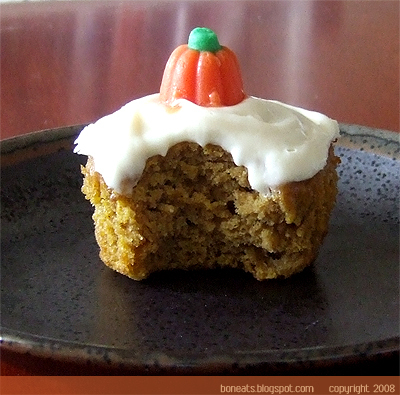 They have a nice light crumb, and unlike some cakes and muffins, the pumpkin isn’t overpowered by the spices. 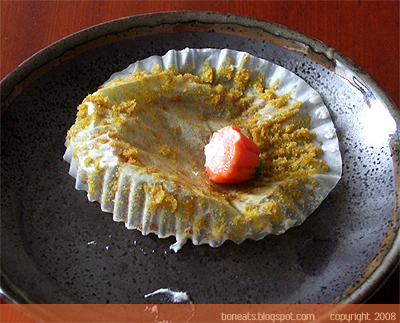 It’s definitely a nice and cute variation from the normal pumpkin pie, which I unfortunately did not have a chance to have this year. And don’t, don’t skip the cream cheese icing. It’s really the icing that makes these cupcakes so irresistible, and the sweet tanginess of the icing goes perfectly with the spices of the cupcake. These would also be great for a children’s Halloween party! Posted by Bonita at 7:44 p.m.